Jesus came to party! And you’re invited too! Have you had a chance to join the Girardian Virtual Bible Study live on the Raven Foundation Facebook page? If so, we hope you will join us again, and if not, this week would be a great week to start! What is marriage? Why does the Bible use marriage as a metaphor for the covenant God makes with humanity? The jars Jesus filled were not typically used for storing drinking water, but for ritual purification. They were empty when Jesus has them filled with water that transforms into wine. How does this connection to purification ritual impact the story? How does Jesus both fulfill and transform our ideas of purity and purification? How has the marriage metaphor been used to uphold patriarchy? Can we find a better way to understand its meaning, and a better way to understand both marriage and God’s relationship with humanity? God loves us infinitely by embracing us and enhancing our joy, and it keeps getting better. The good wine is saved for last! Come party with us Wednesday, January 16, at 10:00 am CT on the Raven Foundation Facebook page! Today, on the 90th anniversary of the birth of Dr. Martin Luther King Jr., we hope you will take some time to read some of King’s convicting words for yourself. Adam and I are! We are reading The Radical King, edited and introduced by Dr. Cornell West. And we will have a live conversation about it for the next Ravencast, this Thursday at 10:00 am CT on the Raven Foundation FB page. Please join us! Few people so embodied the compassionate – co-suffering – transformative love of Christ as thoroughly and as powerfully as Dr. Martin Luther King Jr. His words and his life breathe fire and energy into our hearts and souls, transforming despair and apathy into hope and activism. Yet, in today’s culture Dr. King has largely been whitewashed and sanitized. His dream of racial justice is mutilated when it is separated from his steadfast passion and hard work for economic justice, peacemaking in every community and nation, and worldwide kinship. The same Martin Luther King who expressed love for his oppressors unapologetically voiced his disappointment in the white moderate. The same Martin Luther King who loved his own nation enough to sacrifice his time, treasure, health and life to encourage and help it live up to its ideals called his government “the greatest purveyor of violence in the world today.” The same Martin Luther King who was a leading voice for interfaith solidarity, compassion, and peacemaking saw clearly the heretical twists of hatred imposed upon his own beloved Christian faith. The same Martin Luther King whose words can guide us to be our best possible selves saw very clearly the depths to which humanity can sink, decrying complacency with evil while never underestimating the greater power of love. How do King’s words convict and challenge us today? How can we be active agents of peace and justice? How can we find the strength to love as King loved? Adam and I certainly don’t have all the answers! We have much to learn from people of color and those who experience the oppressions of poverty, war, and injustice. And we have much to learn from you, because it is only together that we can grow in heart and mind and action. Perhaps more eloquently than anyone else, Dr. King expressed the truth of interdividuality and recognized that our need for each other makes hatred, violence, racism, and all the other ways we divide ourselves not only evil, but deadly – suicidal. He best understood that I cannot be all that I am meant to be until you are all you are meant to be. So let us learn about Dr. King and then spread his message – the message of God’s all-encompassing justice and all-embracing peace – by living into our fullest human dignity the only way we can: together. Join us at 10:00 am CT Wednesday for the Girardian Bible Study and Thursday for the Ravencast on Dr. Martin Luther King Jr. We’ll bring in your questions and comments. See you at the Raven Foundation FB page! 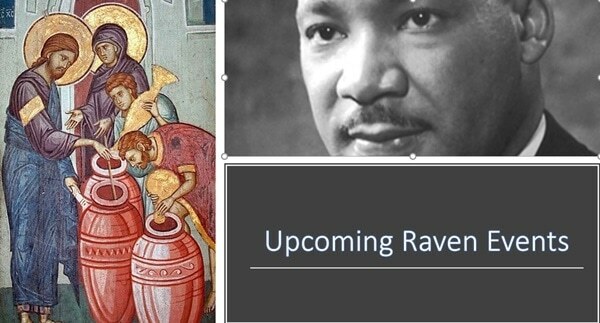 Images: The Marriage at Cana and Martin Luther King, Jr. Both images from Wikimedia Commons.